"Everything about this recording is about making a larger picture out of many various elements," Terri Lyne Carrington said. Carrington says "The Mosaic Project" makes her feel, "a little bit like a trailblazer"
(CNN) -- She's a drummer, a producer, a vocalist and a mom. Terri Lyne Carrington knows a lot about transformation. In fact, "Transformation" is the title of the first track on Carrington's Grammy-nominated CD, "The Mosaic Project." The vocals on the track "Transformation" are performed by Nona Hendryx, perhaps best known from her days as part of Labelle, the singing group from the '70s that helped launch the career of the iconic singer Patti LaBelle. Carrington explained the song was originally written and recorded by Hendryx in the 1980s. "I remember growing up listening to it and it was always a song I felt connected to on some level," Carrington said. In later years the two performed together and Carrington said when she started to put "The Mosaic Project" together, she thought, "Why don't we do a jazz version of 'Transformation'?" The song varies quite a bit from the original and Carrington said she wasn't sure Hendryx would even like her arrangement. She said when she played it for Hendryx, "First she had to really get used to it and then she ended up really loving it and she sang it great as well." "The Mosaic Project" is Carrington's fifth album. A child prodigy, she has toured with some of the greatest names in jazz over the past two decades, including luminaries such as Herbie Hancock, Dizzy Gillespie, Al Jarreau, Joe Sample and Stan Getz. In fact, Carrington, now 46, was only 11 years old when she performed with drummer Buddy Rich on a television show, impressing him with her clean technique and solid coordination. 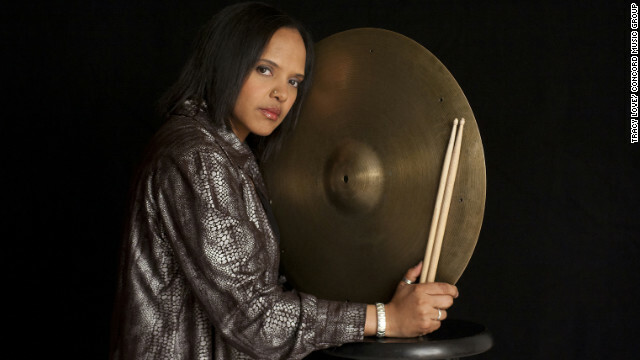 She said "The Mosaic Project" makes her feel, "a little bit like a trailblazer," because when she was a kid starting out there weren't any other female drummers that she knew of and only a few female instrumentalists. "It's good to see a lot of younger women not having any preconceived notions about what they can do," Carrington said. "It seems normal for a lot of them to play male-dominated instruments and I think that's a beautiful thing. Everything about this recording is about making a larger picture out of many various elements." To that end, she gathered most of her closest friends (who happen to be great musicians and great singers) and had them help out with the project. Carrington said she envisioned the project for awhile, then "...it came together. The stars aligned and everybody was on board, so I was very fortunate." Included in that list of "friends" are some of the most prominent female jazz artists of the last few decades, including, besides Hendryx: Esperanza Spalding, Dianne Reeves, Dee Dee Bridgewater, Sheila E., Cassandra Wilson, Geri Allen and more. The 14-song set weaves a story of transformation, using everything from jazz to hip hop to the spoken word. Civil rights and women's rights activist Angela Davis introduces a track called "Echo," which Carrington said brings together three women who have been very influential in her development as a black woman and "just figuring out who I am." Those three are: Bernice Johnson Reagon of the group "Sweet Honey In The Rock," who originally wrote the song, Reeves, who performs the vocals, and Davis. Carrington said she's most proud of that song. Listeners might be surprised to learn "The Mosaic Project" also includes a cover of the Beatles classic "Michelle." Carrington makes no secret of her affinity for the Beatles' music. On her last CD, "More to Say," she covered "Let it Be." Carrington said she wrote the arrangement of "Michelle" a few years back and played it live, but this seemed like the right time to record it. "I'm already thinking about the next Beatles song" she said with a chuckle. Drumsticks in hand, Carrington is helping trumpet the joys of jazz to new generations and new audiences and she's optimistic about its future. "It's a high art form," she said. "I don't think it's going anywhere." She said people often ask her if jazz is dead. "I still put on the classic jazz and it's still very much alive," she said. "What's happening is it morphs and changes. But the library that's being created under the umbrella of jazz is incredible and it's just more and more music that people will have access to."